Israeli bulldozers are tearing up Palestinian structures at a rapid pace this year, destroying more than 500 houses and other buildings and displacing more than 650 men, women and children in three short months. The demolition spree is outpacing last year’s rate by more than three to one, and monitoring groups are raising the alarm. MORE . . .
Israeli forces Thursday demolished a rainwater harvesting well near al-Arrub refugee camp, north of Hebron city, in the southern West Bank, said a local activist. ___ . 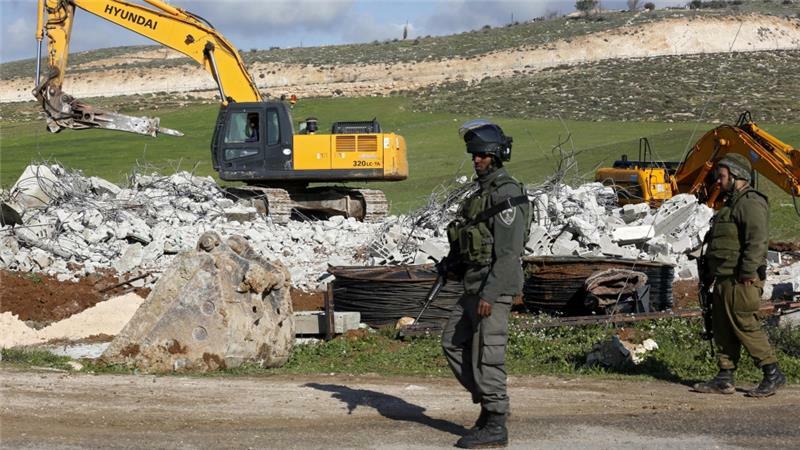 . . bulldozers escorted by Israeli forces and so-called Civil Administration officers stormed Abu Suda locality, opposite to Biet al-Braka church compound, north of the camp, and demolished a Palestinian-owned rainwater harvesting well. ___The well-owner was identified as Saleh Nimer from the refugee camp. MORE . . .
Israeli forces raided a money exchange office in the occupied West Bank city of Ramallah at dawn on Thursday, causing a fire in the building. ___Witnesses said that Israeli soldiers fired stun grenades in the al-Ajouli currency exchange service, causing a fire which spread inside the building. MORE . . .
For years American taxpayers have been bankrolling Jewish-only illegal settlements in the West Bank with hundreds of millions of dollars funneled through tax-exempt non-profit organizations . . . One of the organizations which is a frequent recipient of these donations is the Brooklyn-based Hebron Fund which supports Hebron’s settler community. ___Haaretz reports that Goldman Sachs has a “clear pattern” of giving to Israeli rightwing groups through their Charitable Gift Fund, including the notorious Jewish zealots in Hebron. MORE . . .
___“The continued Israeli colonization of Palestine is a war crime under international law,” Erekat said in a statement. “This is an official policy of the Government of Israel that continues to entrench Israel’s colonial occupation and destroy the prospects of two independent states . . . . MORE . . .
Israel is adept at creating new Palestinian refugees and internally displaced persons . . . . Today, it is using the recent violence in the Occupied Palestinian Territory (OPT) to introduce a dangerous new twist to its long-standing residency revocation policy to force Palestinians out of East Jerusalem. ___This new concept –”breach of allegiance” to the state of Israel – is now being used to revoke the residency of Palestinian Jerusalemites, in addition to possible demolition of their family homes. MORE . . .
and your memory wounds me. leaving my traces before I die. or desert strangers, coming from oils wells, coming. and I never enter it. cities of green? Those cities we love. Hanged with the noose by the blue guards. Guarded by rubies, oil, and gold. IZZ AL-DIN AL-MANASRA was born in Hebron in 1946. He has been the Director of cultural programs in Jordanian radio, editor of Palestinian Affairs magazine, and worked as a professor of comparative literature in Constantine University in Algeria. He has been the Secretary general of the Arab Contemporary Literary Society since 1984. He has published many volumes of poetry. MORE . . .